POMONA >> Pomona has ended an agreement with the U.S. Marshals Service to house federal prisoners — who may include undocumented immigrants — at the Pomona City Jail, immigrant rights advocates announced Monday. 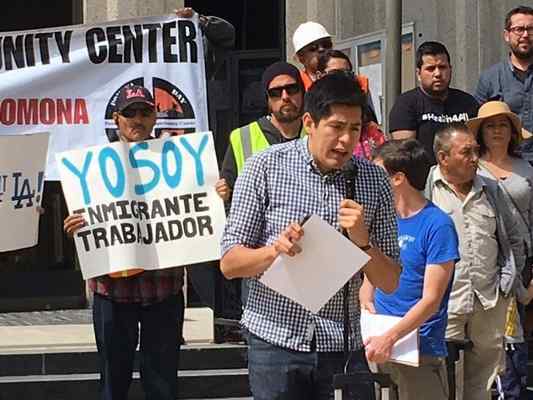 Representatives of various groups and organizations — including the Pomona Economic Opportunity Center, also known as the Pomona Day Labor Center, Gente Organizada, which translates to Organized People, and others — gathered outside Pomona City Hall on Monday to announce the end of the agreement. During the press conference, Fernando Romero, the center’s executive director, read a statement from Mayor Tim Sandoval and Pomona City Council members. “This is your community. We assure you that Pomona is committed to protecting the rights, safety and dignity of all immigrants,” the statement said. “We will not cooperate or collaborate with federal agencies that intend to do harm or undermine the decent and humane relationship we have with you. The statement referred to a resolution the City Council passed late last year, declaring the city a “safe place” for all immigrants. The resolution denounces intimidation tactics used against residents, including “immigrants, people of color, Muslims, LGBTQ people, and people with disabilities.” Council members also approved a companion resolution in support of the city’s Muslim community. Last month, council members directed City Manager Linda Lowry to end the contract with the federal government. The agreement between the city and the Marshals Service had been in place since 2003, according to a memo dated Feb. 15 from Lowry and Pomona police Chief Paul Capraro to the council. Under the agreement, the Police Department received federal prisoners in custody with either the Marshals Service, the Drug Enforcement Agency or the Immigration and Naturalization Service — as U.S. immigration authorities were referred to at the time — and the city would receive $75 a day per prisoner. During a five-year period, the agreement generated about $75,800, but revenues have been declining in recent years, Pomona police Capt. Mike Ellis said. In the 2015-2016 fiscal year, the agreement made no money for the city. The department recently reviewed the agreement, the revenue it generated and requirements the city had to meet and determined the agreement — which ran indefinitely — didn’t make financial sense, Ellis said. The department also considered residents’ concerns about interaction between the federal government and the Police Department. Ending the agreement “puts that segment of the community at ease,” he said. Pablo Alvarado, director of the National Day Laborer Organizing Network, applauded Pomona’s move. Elected bodies must take a stand on issues such as this and determine and adopt policies that show support for immigrant residents, he said. This is not a time for symbolic gestures, he said.